Eggplant parm, parmigiana, parmigiana di melanzane, whatever you want to call it, it’s always good. The only thing is, it can be a pain to make. First you have to fry or bake the eggplant slices, then make the sauce, then grate the cheeses and layer them all then bake and only then can you eat. 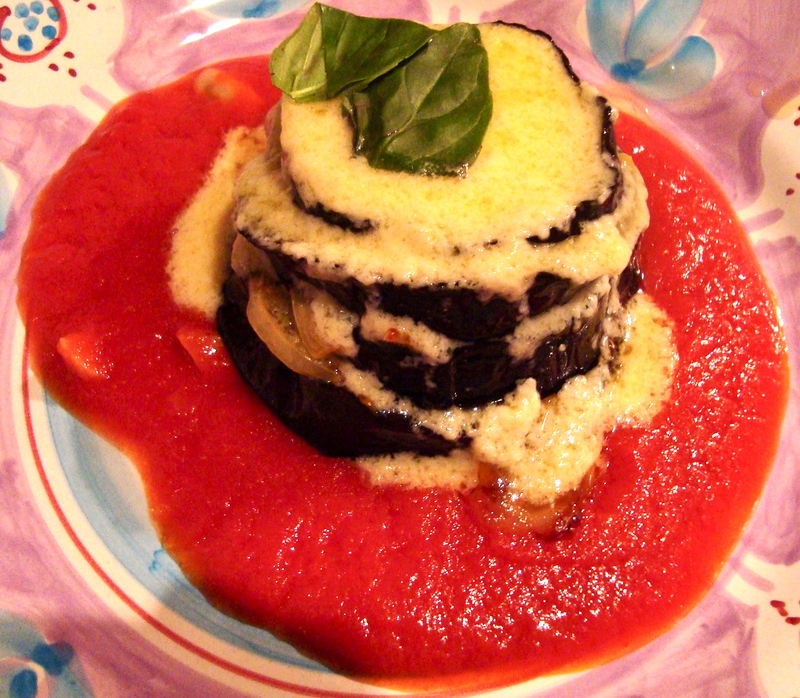 Somehow, I thought I’d bypass all the lengthy oven time by making a modern, cleaner version of eggplant parm. That essentially took as much time as the original. A few things this version does have over the original, though, are convenience, aesthetics, and a little thing called crema di parmigiano. I’d only had crema di parmigiano (or Parmesan cream) once before when it made a fleeting appearance at passatelli night, and it took me six whole months to attempt to recreate it. Good thing I did because now I’m about to recreate it at least once a week for the rest of my life. See that gooey, creamy, cheesy sauce up there? That’s what I’m talking about. It’s basically a bechamel where you substitute the flour for copious amounts of cheese. And it’s amazing. But back to the food. The most important plus about the deconstructed version of eggplant parm, though, is, as I mentioned, the crema di parmigiano, of which there’ll probably be a little extra after all is served and eaten. A little extra that you can eat with a spoon, or spread on toast, or slather on more cheese, or eat in a sandwich. It’s definitely not going to to help me fit back into my pants anytime soon, but I don’t care. I love cooking and eating. And looking good? It’s not really that important anyways. It’s actually a lot faster and easier than it looks. While the eggplant bakes, make the sauce and the crema. All in all, from start to finish, I’d budget about 90 minutes for this puppy with ample do nothing time in the middle. These quantities make about 6 stacks, which would make perfect first courses or second courses if there’s too much to eat already. Feel free to tinker as you see fit. Perhaps some smoked mozzarella or taleggio instead? To begin, turn on the oven to 400F/200C. Line two baking sheets with tin foil and arrange your eggplant slices on the foil so they’re not overlapping. Drizzle some oil, then salt and pepper over; flip them all over and repeat. Make sure there’s enough oil on the bottom or they’ll stick to the pan. 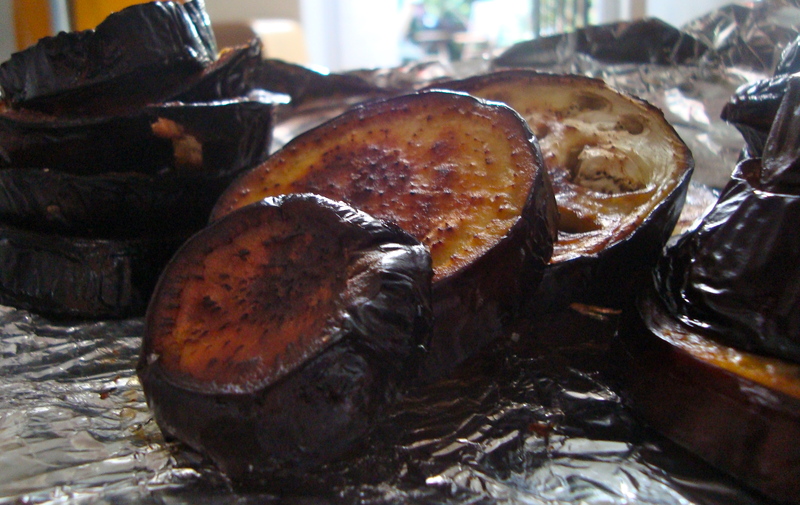 Bake the eggplant slices for 35 minutes or so, until they are soft all the way through and brown. You may want to flip them over halfway, but it’s not necessary. If you’re planning to eat right away, don’t turn the oven off once the eggplant are done. 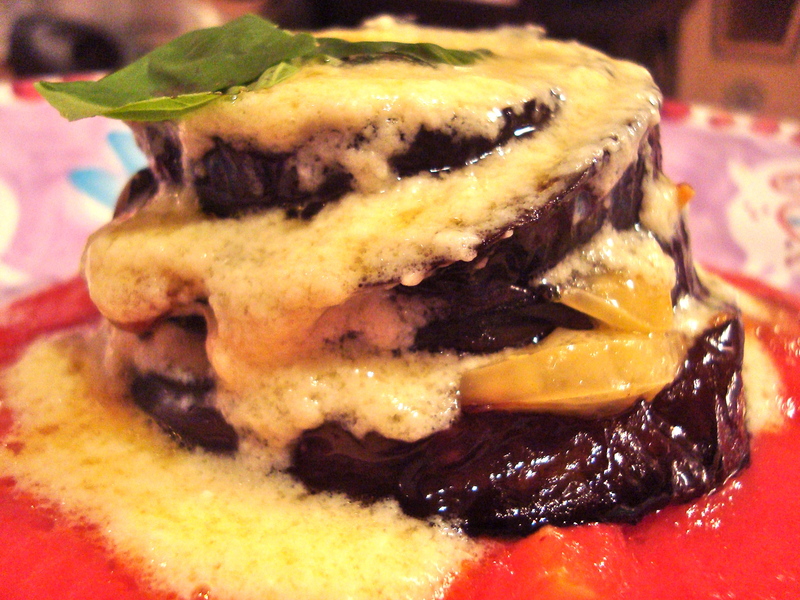 While the eggplant is baking, make the tomato sauce. Cover the bottom of a saucepan with olive oil and heat over medium-low. Add the minced garlic, and simmer for about 10 minutes, lowering the heat if necessary. You don’t want the garlic to brown at all…you just want it to sit there, bubbling gently. After about 10 minutes or so, add the tomato puree and a dash of salt. Stir well, turn heat up a bit and partially cover the pot to avoid splatter. Cook for 10 or so more minutes until you taste it and you decide it’s delicious. While that’s cooking or if you’re done, make the crema di parmigiano. In a saucepan, melt the butter over medium heat. 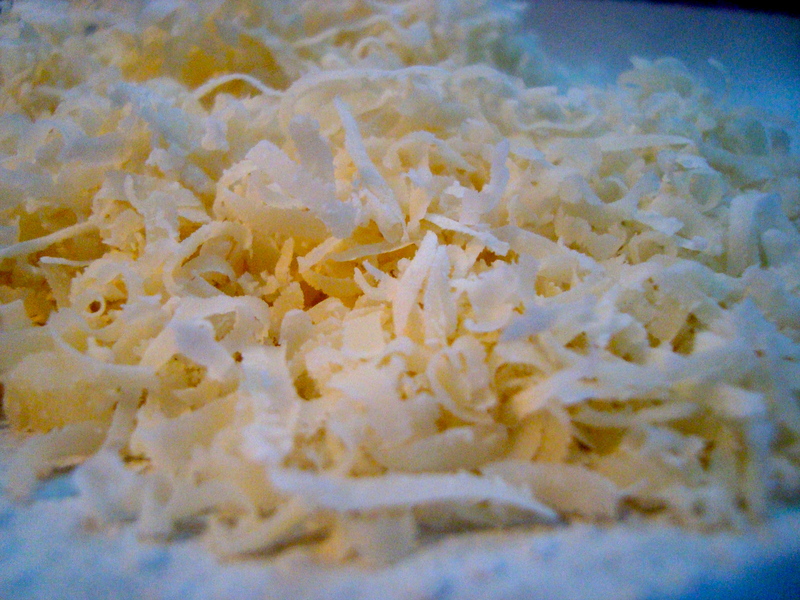 When fully melted, add all the grated cheese and using a fork or whisk stir vigorously and constantly. Once thickened, slowly whisk in the milk. Let the mixture cook for a few minutes over medium heat; you just want it to be bubbling lightly. Add more milk if it’s too thick, keep reducing if too liquidy. Remove from heat when ready. When you’re 15 minutes away from dinnertime, turn on the oven if it’s not hot already. Start slowly reheating the tomato sauce and crema di parmigiano. Now, to assemble, line a baking tray with tin foil and arrange your six largest eggplant slices. Top them with your six largest mozzarella slices, then put another layer of eggplant, then mozzarella, until all your eggplant and mozzarella are used up. Return to your still – hot oven for 10 – 15 minutes, or until the mozzarella has totally melted. Now, set up your six plates. 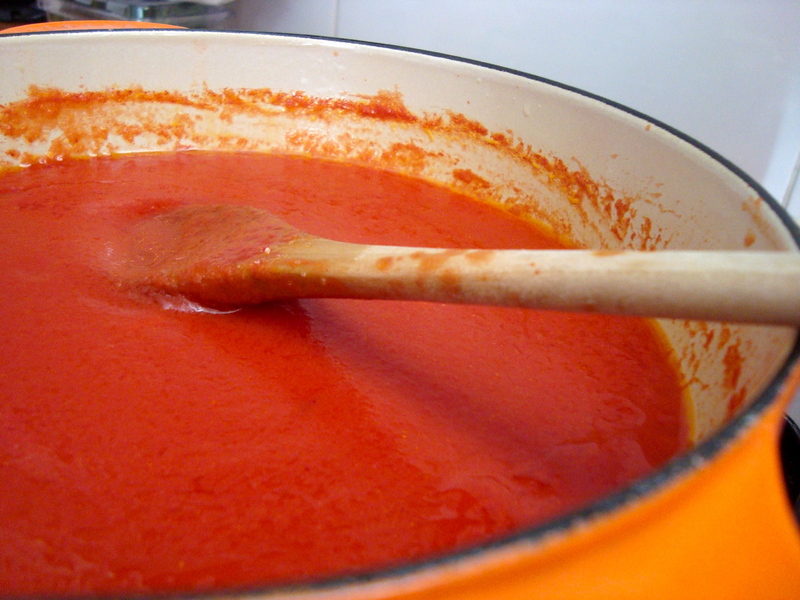 Spoon a big ladle of hot tomato sauce into each plate. Then use a spatula to remove each eggplant-mozzarella stack from the tray and place onto a tomato sauce puddle. When all six stacks are plated, top evenly with hot crema di parmigiano and a basil leaf. Serve immediately. Scrumptious photos! Cheese…the secret to making eggplant palatable. I can tell you are very good at that. This looks beyond delicious, in fact positively addictive! It is one of my favorite foods anyway. As always, fantastic!! Happy Birthday!! HAPPY BIRTHDAY TO YOU ~ HAPPY BIRTHDAY TO YOU!